EDIT: I've had few so this is probably a useless statement..
Well my car is white, it must of missed the memo to be slow. And are Turbo cars are not affected as much as NA cars running in higher altitude. But if you are pushing the limits of your setup at low altitude then run at high altitude you would see a difference. I think that is backwards. If you are pushing the limits of your setup at high altitude, you won't see any gains at lower altitude. You should always see a decrease in performance when going from lower to higher altitude. This is based on a vehicle running sea level-ish versus "a mile high"(Denver, CO), and making no changes. Same boost, same cams, same CR, same injectors, same tune. I would love to discuss further if there are folks who disagree. I do feel that if that is the case, we should start a new thread so as not to clutter this 'stickied' thread. Agreed to a point only because boost is in play. N/A cars will always run stronger at sea level. Seems to me that if your car was maxed at say 700 awhp pushing 40 psi, same combo might make same power at 36 psi or so at sea level. GizmoVR4 431/1000 GT37R turbo. M&H 26x8x15 drag slicks. Automatic awd. E85 fuel. No nitrous at all (all n20 parts removed from car for weight loss). 40psi boost. Total weight 3235lb on the track's scale. 8's to follow next season after we get the nhra chassis certification, NHRA license, and can make more than one run a day. Sent over my slip specs. Weight was 3360 on the track scale. 30psi on pump gas for the runs. 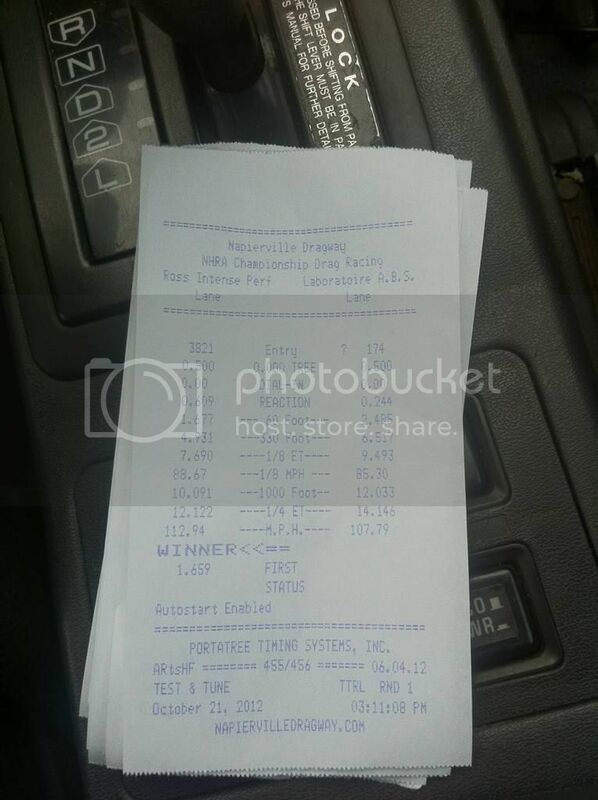 Approx 460whp (first pull on the dyno a couple weeks later). 13 months and 1 day between updates and only 2 cars updated? We aren't doing much to help that JSB stereotype! Entry 19 for sleepyvr4 is 1743/2000 - I know because I now own it and actually have the posted timeslip in the cars records (I can repost it for confirmation if desired). Car had a SBR G50 on it when I got it and I don't think ever beat that 14B time with that on - I've never taken it down the quarter. Start a build thread on NEDSM so I can see it. I cut my times down a bit. If it takes 13 months to update again hopefully I will cut them down even further before then ! This is the timeslip on the far right of the picture. My latest and best results. Holset hx40 33psi street tuned! Time slip available but my phone wont let me post it! E85, holset hx 40 on 33 psi, street tires, no nitrous, and time slip available just my phone wont let me post it here! 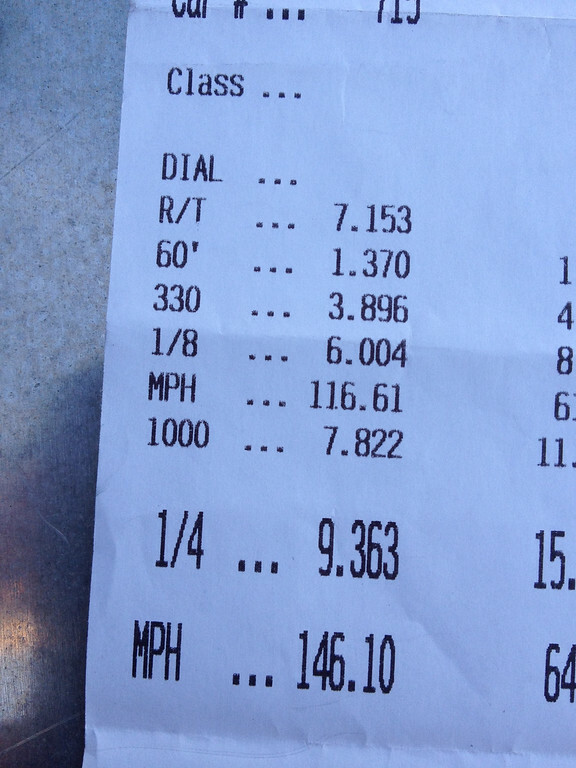 584/1000 has only made two passes at the track - since I have 431 likely won't be making any more anytime soon ! The car made 556AWHP @30 psi and went [email protected] full weight and working a/c on street tires - dove it to the track and home. The 11.6 was on soft launch and lifting to shift - I'm sure the car would go 10.9x if we put the effort in!! As always many thanks to Nate Crisman !!! My fastest pass to date. 28 psi on a Turbonetics T3/T04E bb 50 trim on E85. Toyo Ra1 tires at summit motorsports park during the dsm shootout Max Effort event. Last pass of the year for the old girl. Done messed the transmission up the pass after. I was going to take it apart anyway. Need to find 2 tenths before I replace the turbo. I think it's there with more timing and a better 60. 806/1000 Just got into the 9's today! M&H 24.5" tall slicks, FP3794, no nitrous, manual Trans, E85. This thing is severely outdated and all the links are broken. Any plans to maintain/fix it? Generated in 0.266 seconds in which 0.223 seconds were spent on a total of 14 queries. Turbo powered.